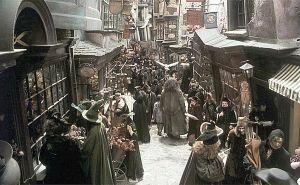 Division Street will become Diagon Alley, at least for a night. That’s what a group of Northfield retailers are working on for Friday, July 20th. At midnight on that date, the final Harry Potter book will be released. Downtown merchants are planning a variety of activities for the hours leading up to twelve o’clock. Those people participating in the planning to-date include Jon Lee, of River City Books, Norman Bulter, of Chapati, Julie Bixby, of the Contented Cow, Jerry Bilek, of Monkey See, Monkey Read, Linda Schneewind, of digs, Dave Machacek, of ArtOrg, and Sue DeMalignon, also of River City Books. Last week an e-mail was sent out to retailers, inviting them to participate. Interested merchants should contact Linda at digs.